The Washington Nationals have agreed in principle with Jeremy Hellickson on a new one-year deal for the 2019 season. It is an incentive-laden deal with a $1.3 million base guaranteed. The former Rookie of the Year received a major league deal and will be the 25-man roster once the contract is made official pending a physical. If he makes at least 24 starts this season, Hellickson”s salary plus incentives would total not less than $3.1 million for the season. The full incentives package totals $4 million if he makes at least 30 starts which would then give him a $5.3 million total compensation for 2019. This new deal is $700,000 lower than the package the Nats gave him in 2018 when he finished with a +1.2 WAR for the season. 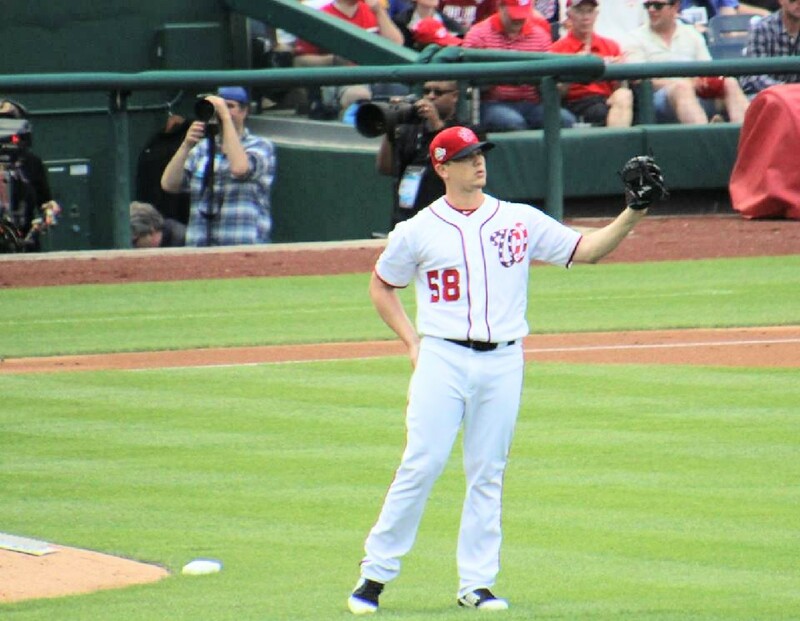 Last year, Hellickson proved to be a case study in analytics as the Nationals plan was to allow him to face the opposing batting order twice then put a tight leash on him as the batters saw him for a third time. On the first time through the batter order, opposing batters only hit Hellickson at a .192 batting average while the second time through the order it rose slightly to .214, and the third to through the order that number almost doubled to .419. The plan worked well although he only averaged 4.81 innings per start last year which is part of the give and take with Hellickson, but the team received a very strong 3.45 ERA. If you want to look at that ERA more optimistically, Hellickson gave up 8-runs in one start, and if you removed that one start, he actually pitched to a 2.78 ERA in his other 18 starts. While averaging 4.81 innings per start is not optimal, this is how baseball has evolved for starters in the back of the rotation. Hellickson kept his team in all but one game last year while never giving up more than 3-runs in the other 18 starts. His team winning percentage in his starts was 11-8 which is a .578 pace and exactly where you would minimally want to see a starter as that extrapolates to 94-wins in a season. In Hellickson’s career, he won the Rookie of the Year for Tampa Bay in 2011, and Tampa traded him for spare parts to Arizona after two poor seasons in 2013-2014. Hellickson’s value really plummeted after a disastrous season in Baltimore in 2017, but Mike Rizzo liked the underlying analytics and signed him to a minor league deal last year. Hellickson had two fluke injuries in 2018, and he will turn 32 years old in April. On his durability, Hellickson had June and August stints on the disabled list. The June injury was to his hamstring when he was relayed a poor throw at the first base bag and lunged for the ball. He then suffered a wrist injury on another fluke play as he uncorked a wild pitch and covered home plate while landing awkwardly on his arm as his wrist buckled. The two DL stints cost Hellickson nearly 60 days off the schedule. The best news is Mike Rizzo brings in a 5th starter to allow Joe Ross who is on an innings limit to conserve his innings and become the 6th starter for depth with Erick Fedde and Austin Voth behind Ross. In addition, Mike Rizzo added Henderson Alvarez on a minor league deal giving the Nationals much more depth than they had last year. 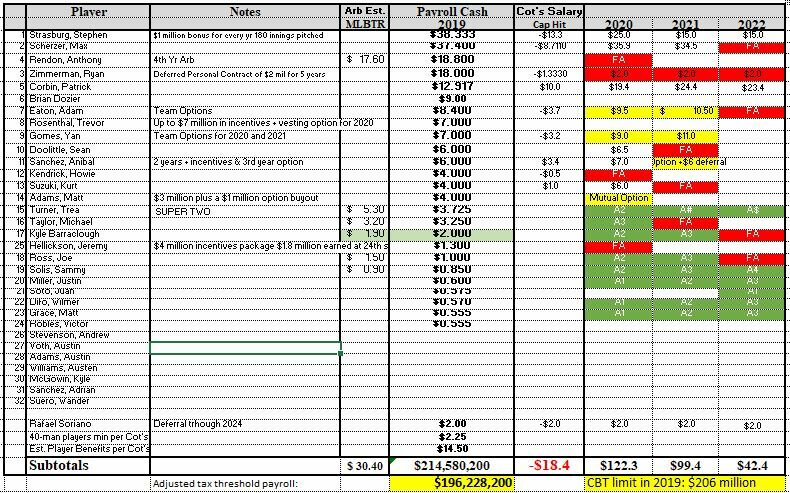 Back to Hellickson’s incentives per Craig Mish of Sirius/XM who broke the Hellickson news last night reports that for games played those incentives are earned at $200,000 per milestone at 3/5/7/9/11/12/14/16/18/21/23 games played and above that at $300,000 per milestone at 25/26/27/28/29/30 games played for a maximum total of $4 million. If Hellickson starts 30 games he will max-out his earnings at $5.3 million. Between Trevor Rosenthal, Anibal Sanchez, and Jeremy Hellickson, the team has $13 million in incentive pay on the line. For a team that is now at $196.2 million in payroll before incentives and bonuses, this Hellickson acquisition taps out the team. If all incentives are earned, the team would bust past the $206 million CBT cap. The Nationals also pay bonuses to players with All-Star game appearances and awards they win such as Cy Young, Silver Slugger and MVP. It does not give much room if any to stay under the cap unless a contract is restructured or a trade is made. Ryan Zimmerman‘s contract would seem ripe for a restructure, and Michael Taylor could still be the odd man out depending on how Victor Robles does in Spring Training. Taylor is set to earn $3.2 million in 2019. There are certainly still many moving parts as the Nats will have to make a roster move to accommodate Hellickson on the 40-man roster. We are just 8-days from Spring Training camp opening. Last year Jeremy Hellickson was not signed until March 18th, and this year he should have a full spring training to get ready for the start of the regular season as he now projects to start on April 3rd against the Phillies or possibly they skip his start with the early off-days on March 29th, April 1st and April 5th so Hellickson could be pushed back to April 10th in Philadelphia. This entry was posted in Analysis, MikeRizzo. Bookmark the permalink.